Home → Pet Care → Cat → Cats Eating House Plants and How to Stop Them! Cats Eating House Plants and My Solution! Today I wanted to share with everyone my cat Wally and his addiction to my house plants! He is a cat that LOVES to chew and lick plants! Especially in the morning when he is waiting to be fed. He gets impatient and runs over to the herbs we are TRYING to grow in the window sill. He obsessively chews on them in anticipation for his breakfast! Not sure why, but I think that could be a whole different article. I want to share why this is such a danger for cats (poisonous plants) and what I have done to solve the problem! It doesn’t matter what type of plant it is, but Wally will chew on its leaves or flowers. I cannot leave a bouquet of flowers or plant on the dining room table (or anywhere for that matter) because he does this! 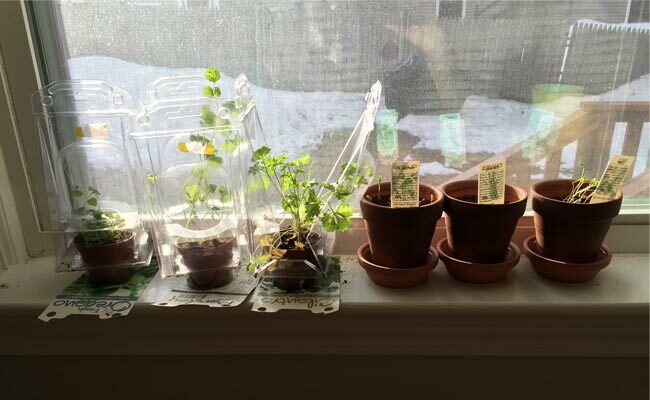 We thought putting the freshly planted herbs in the window sill they would be safe. We were wrong! He climbs on the counter and stretches himself as long as possible reaching over to the window sill! Usually knocking one of the plants over in the process. GRRR…they are never going to grow! I am growing him fresh cat grass or wheat grass for him to chew on instead! My mother gave us a kit to do this for Christmas. Even came with a cute little cat pot to grow it in. You can buy your cat grass kit here: Cat Grass Kit . The grass grows very fast typically 5 days. Wally is enjoying it very much and so far so good from deterring him away from our fresh herbs! I am also going to start growing him some cat nip this spring. Prixie, our other cat, does not care to touch, eat or lick any plants, but they both seem to love cat nip! I am curious to see if she will enjoy the cat nip if it is a live plant vs. the dried pieces she loves! Check back soon and I will let you know!